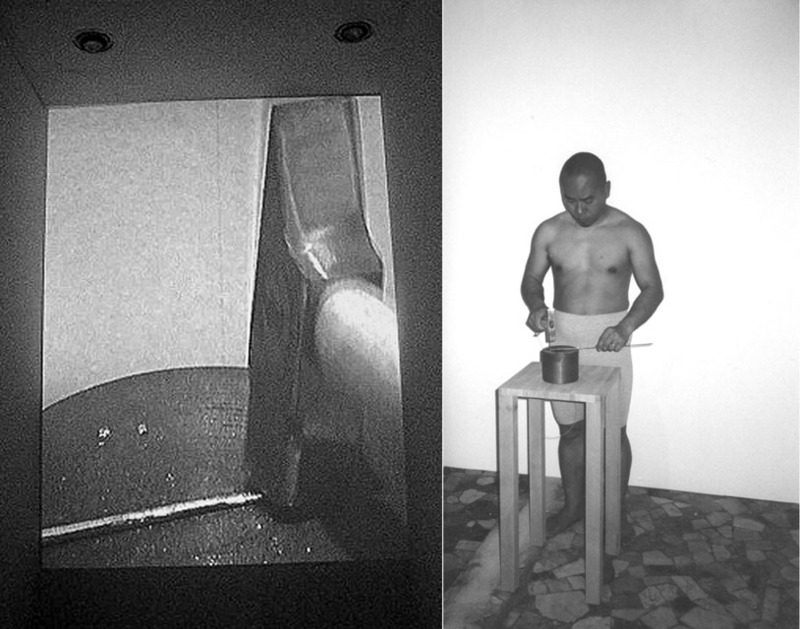 Article: "Craftsmanship", "Bodily Synthesis" and "Art Practice"
“Golden Proportion” isa work that combines performance and video. A golden pin 24cm long, which is the length of my head, is hammered by me and extended to a length of 164cm which is the height of my whole body. In repeating this bodily activities that is nearly unconscious, my body, as the subject of experience, experiences the hammering action which involves sight, sound and the overall coordination of body motion. At the same time, this also causes the gold to change its physical state. It becomes thinner, longer and more fragile. A close-up video projection documenting the scene when the hammer strikes the golden pin is enlarged and projected as a background for the performance. I attempt to use media and imagery to provide a reading from another point of view. In addition to all the values and meanings given by culture, gold, as a material, also has very specific physical characteristics. Gold has a very high extensibility. A small piece of gold can be struck into a very thin gold foil. 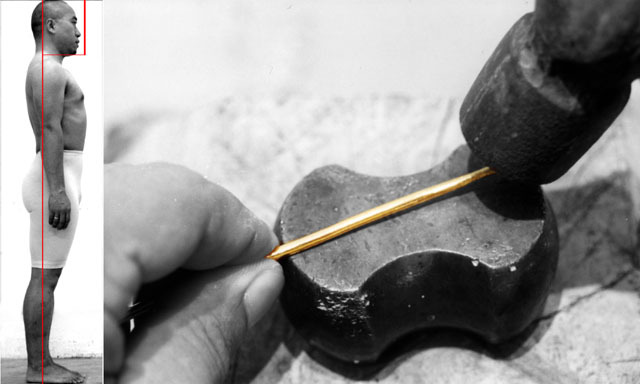 “Golden Proportion” begins with experiencing the physical characteristics of gold. Through the senses and the activities of the body, it makes use of physical changes to symbolize a pursuit for a model of metaphysical perfection – the golden proportion in ancient Greek. It is also a relationship between perception and conception. This relationship takes place on my body and is also projected for the perception of the audience through sound and image. The golden pin was hammered from the length of my head to the height of my whole body. The ratio of my head and body is 1:6.833…… (different from the golden proportion of ancient Greek which is 1:1.618……). By undertaking this prosect, I redefine myself as a perfect model of an independent individual. This can also be regarded as an affirmation of individuality.